The Tamil National Alliance (TNA) MP for the Jaffna District M.A. 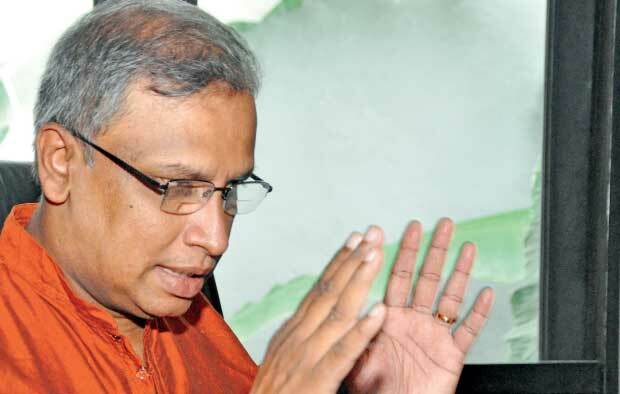 Sumanthiran, in an interview with the Daily Mirror stressed the point that the bill to give effect to the International Convention for the Protection of All Persons from Enforced Disappearance should be enacted. He said enforced disappearance of persons is a crime to be dealt with locally. Q : This is seen as one of the most obnoxious piece of legislation by its critics. How do you look at its content? This is actually a convention which Sri Lanka acceded to and ratified. Once you ratify it, you have to give it effect in the local laws. The convention is against the disappearances. What should be obnoxious is the rejection of it, not taking action against disappearances. Sri Lanka should be ashamed that we have disappearances numbering more than 100,000 including 68,000 during the 88/89 period and 30,000 now. That is very, very high in the world. That should be a matter of shame. Q : Then, it is said that the bill contains provisions providing for extradition of those with command responsibility to another country to be tried if requested on bare allegations. What is your response? That is false. There is no such thing in the convention. They have to be prosecuted. The State must take action. Q : Does it mean that anyone responsible has to be tried locally? Q : It means there is no such provision? Not for offences committed here. If somebody did these crimes in South Africa and hid himself here, then, South Africa can seek his extradition. Similarly, as for Sri Lankans, who committed these crimes here and hide themselves elsewhere in the world, Sri Lanka can ask for their extradition. That is it. Q : Again, it means that Sri Lankans cannot be extradited to be tried under the law of another country? Q : In terms of the reconciliation, on what basis do you consider it as an important piece of legislation? It is very, very important for reconciliation. Disappearances are a scourge that must be dealt with effectively. It is worse than murder even. In the case of a murder, families concerned get to know and come to terms with it. In case of disappearances, people do not know about it. It is an eternal torture for the family. Such crimes have to be curbed. Definite action must be taken against that. Without dealing with it, it is impossible to reach reconciliation. The content of the bill is to make enforced disappearances an offence. Making an enforced disappearance of a person is an offence. That is the gist of that law. Q : There is fear that those who had command responsibility during the war time will even be tried not under the law of Sri Lanka but under the jurisdiction of another country. How do you respond? That is a false fear. They will be and must be tried in the country. Without this law, there is no law to try them. All of us accept that causing the disappearance of a person is a heinous crime. If it is so, those responsible must be brought to book. This is the law that is being brought to the law book of this country. In other countries, there are laws. You need not pass laws here if they are to be tried elsewhere. That is to prosecute them here. Q : How serious is the Tamil National Alliance (TNA) in this regard? The TNA has constantly been advocating this. That is why we pushed for the Office of Missing Persons. That will deliver some answers to people. This keeps recurring in Sri Lanka. Firm steps should be taken with regard to that as well. Q : Though the Office of Missing Persons Bill was signed into Act, it is yet to become operational in the country. What are your views? We are very concerned. The law was passed last August. It should have been operational immediately. They said there are some amendments to be done. That has also been done. It is yet to be brought into operation. That brings into question the Government’s commitment to do what it promised to do. Q : The TNA played a role in the installation of this Government. Do you feel being let down by the Government? I do not say ‘let down’. But, we are disappointed that many of the things that should have been done and completed are being dragged on. The Government does not seem to have political will to meet the promises it made in their entirety. We have started telling the Government that it must boldly do the right thing. Q : Apart from the Government, how do you see the future of the constitution making process in the wake of a call by the Mahanayake Theras that there should not be a new constitution? The Mahanayake Theras knew for a long time that the constitution making process was going on. They did not say anything about it then. On previous occasions, they had even spoken for it. I do not know why they came out with this statement suddenly. After the President met them and assured that whatever draft would be discussed with them, they seemed to be satisfied with it. Obviously, someone has managed to give them some wrong information. Q : How optimistic are you about the future then? I won’t say I am optimistic or pessimistic. We have given our 110 percent cooperation to achieve reconciliation in full. A key factor of that is the new constitution. We are participating in the process very responsibly. We have been flexible to arrive at a conclusion. That is all we can do. We cannot act for the government or the other parties. We can only hope that they will reciprocate and constructively continue to engage in the process to have a new constitution. Q : There are reports that you are seeking a meeting with the Mahanayake Theras to brief them about this. How true is it? After we have the interim report releases, we will talk to various people. We will talk to all the religious heads also. When we do it, naturally we will talk to the Mahanayakes as well. Q : There is concern that the foremost place accorded to Buddhism would be compromised in the proposed Constitutions. What is your position? We have not objected to the foremost place being given to Buddhism although that violates Fundamental Principles of Equality. Sri Lanka cannot say all its citizens are equal if the constitution says Buddhism is given the foremost status. But, if the Buddhist people want a constitution like that, we have no objection. It should be the Buddhists who should protest giving Buddhism the foremost place. I do not think Buddhism is a philosophy that projects itself to have a higher status than other people. That is a philosophy that is self-effacing. It gives away. That is the core of Buddhist faith. Wanting higher place is antithesis of Buddhism. If the Buddhist people want to be anti-Buddhist and want foremost place to Buddhism, we have no objection to that. That is the religion of majority. But giving that status cannot result in unequal treatment to adherents of other faiths. It cannot result in discrimination of any kind towards non-Buddhists. Q : There is the allegation that the activities of other religious extremists groups pose a threat to Buddhism. How do you respond? Nothing can pose a threat to Buddhism. Buddhism is pure if it is practiced properly. No outside force can pose a threat to Buddhism. Recently, a Buddhist told me that the problem is everyone in the country wants to protect Buddhism but not to follow it. If everybody follows Buddhism, Buddhism will thrive. Q : As for TNA politics, how do you see the future of your party in the wake of crisis involving Northern Province Chief Minister C.V. Wigneswaran? There is no problem with the TNA. The issue was that the majority TNA members of the Northern Provincial Council lost faith in the Chief Minister. Once they lost confidence, they intimated that to the governor. It should have ordinarily resulted in the Chief Minister being displaced and somebody enjoying majority support being appointed the Chief Minister. But, the Chief Minister agreed to reverse his decision which gave rise to the loss of confidence in him. Therefore, the members decided not to proceed with the no-confidence motion. The situation is that he still remains as the Chief Minister who does not enjoy the support of majority. Q : There is an allegation that the ITAK, the ally of the TNA, tries to alienate others. What is your response? The ITAK is the main ally in the alliance. In this instance, the ITAK did not try to oust anybody else. The Chief Minister was acting without any regard to the ITAK as the main party. The Chief Minister has been working isolating the ITAK. Q : How feasible is it for you to work together in this context with the Chief Minister? Once the ITAK members say that they do not have confidence in him by way of a No Confidence Motion, it forced him to reverse his decision. They are confident that they can hold a whip over him and get him to act properly. Q : In a couple of years’ time, you will get an election to the Provincial Council. Will you look to a new candidate for the Chief Minister post? That is too early to say that. We will decide it at that time. Q : When the Council was constituted, many advocating power devolution thought that the NPC would serve as a case study for others on pluses for power devolution. What is your opinion? The Northern Provincial Council has not been able to set that example. One reason is that the Board of Ministers is unable to exercise powers given to them due to various shortcomings in the 13th Amendment. The leadership given by the Chief Minister has also not helped in delivering to people, even with the limited power that they possess.